The Okapi Wildlife Reserve is home to about 5,000 of the estimated 30,000 okapi surviving in the wild. 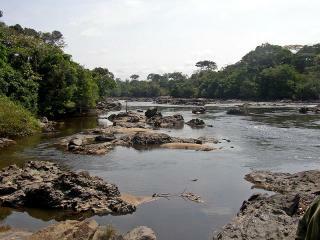 The Reserve, created in 1992, is located in the north-east of the DR of Congo. This Wildlife Reserve is part of the Ituri rainforest. The reserve also contains other many endemic and threatened species of primates and birds. It shares the same geographical region and many features with two other WHS, Dja Faunal Reserve and Salonga National Park. Some 4,000 people live inside the reserve, mostly Mbuti pygmies. We travelled there in 1988 and we were stunned by the natural beauty and the intent of the staff to conserve the area. Etant citoyen congolais vivant a l'etranger, je suis tres interessnt de savoir plus concernant notre unique et special mammel Okapi. Il ya une chose que j'ai decouvert, quant on est chez sios on a toujour la tendence d' ignore la valeur de votre territoire. Mais de qu'on quitte le pays voila l'importance de la fief. Mon souhais en est que vous fassiez toujour des efforts en fin de bien vouloir proteger cette unique espece au monde. Inselbergs: "The inselbergs of the region are a unique habitat which harbor an endemic flora"
Natural sites with indigenous human population: "The reserve is inhabited by traditional nomadic pygmy Mbuti and Efe hunters"
Pygmy Peoples: Some 4000 people live inside the reserve, mostly Mbuti pygmies." and " although not a factor in the criteria for natural sites, the OFR is of special interest for its cultural values as it is inhabited by traditional nomadic pygmy Mbuti and Efe hunters" (AB). Pliocene: "The end of the Pliocene epoch (2.5-6 million years ago) saw a number of long necked giraffids evolve, but largely unsuccessfully with only 2 surving to this day"